If the 2019 South Bay Big Wave Challenge was based on size of the surfer relative to the size of wave, then sisters Landon and Teagan Meza would be top contenders. (The award is presented by the South Bay Boardriders Club to the surfer who catches the biggest wave of the winter). 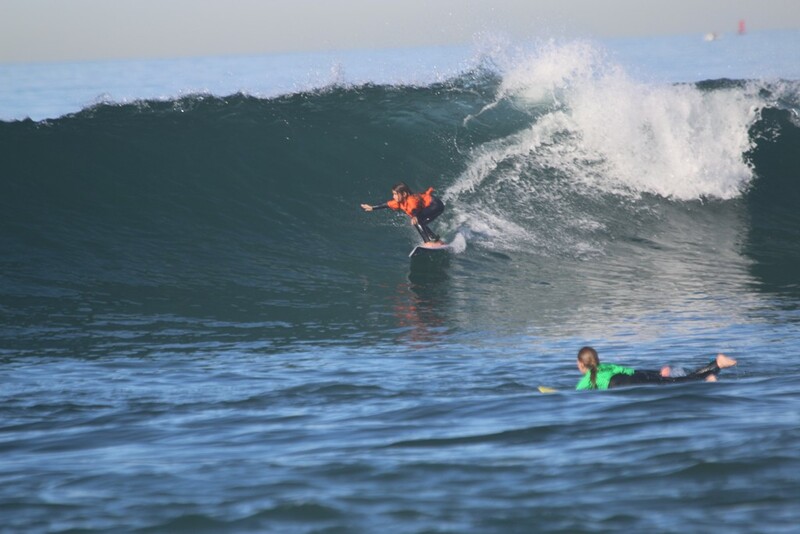 London, 9, and Teagan, 6, each caught waves in the triple overhead range last Saturday during the SBBC/Dive N’ Surf contest, at 45th Street in Manhattan Beach. After being launched into outside sets by their Tom Seth and Pat Miller, they carved their way through to the shorepound, and then paddled back out for more. Their performances earned Teagan first place and Landon second in the Micro Grom Assist division. Lucas Flores was third, followed by Josie Kushner, Charlotte Mullennix and Remi Kushner. Conditions for last month’s SBBC contest were thought to be the best in the club’s 10 year history. But Saturday’s surf, though not as large, had even better shape throughout the windless day. The most tightly contest division was the Junior Boys (under 18). Alex Fry was dominate in winning his first and second heats. But in the finals, he was pushed off the podium by Joey Samuelian. who finished first, followed by Parker Browning and Zach Rosenberg. Parker’s dad Greg, a surf filmmaker, proved he can still perform in front of the camera by winning the Masters division. Lifeguard Tom Seth was second and Dave Schaefer third. Ava Miller won the Junior Women’s division, followed by Erin Wolf and Sofia Rizzi. Mira Costa’s Megan Seth and Charlotte Sabina won and Ashley Weaver took the top three spots in the Women’s Open division. The outside sets gave plenty of time for longboarders to make repeated visits to the nose. Rodney Buck complimented his Old School style by surfing in boardshorts and won the division, followed by Schaefer and Colin MacLeod. In the Open Men’s division, Fry found redemption with a strong, second place finish behind former El Segundo High team rider Eddie Lester. Brazilian Juliano Uzueli, who won his first and second heats, finished third. Top finishers in the Boys’ division were Phillip Barnett, Karsten Wanke and Beau Werger. Matheus Sperb won the Groms’ division, followed by Eljah Nielsen and Charlie Johnson. Marlo Harris won the Micro Groms’ division, followed by Ava Saffell and Michah Salazar.